I often travel to The Netherlands, and mussels are one of typical dishes of the Dutch region of Zealand, in the south-western part of the coast. 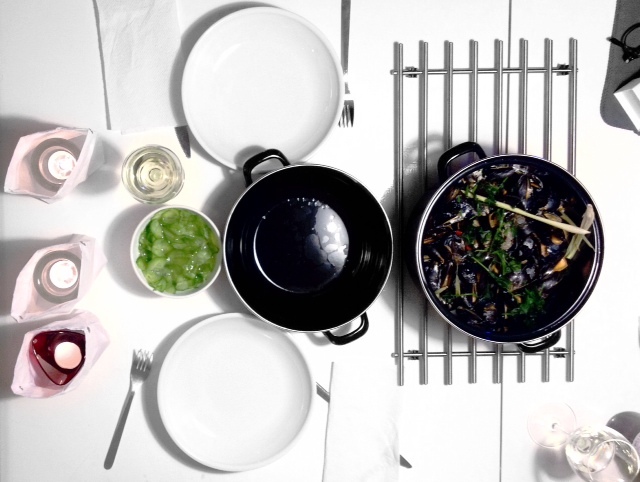 The local traditional recipe for mussels is very simple, as they practically steam them with wine and some herbs. During my last trip to Holland though I had the luck to try an original recipe of Thai-style mussels (thanks for cooking it Tom!) that I want to share with you, as it is so simple and tasty you can easily impress your guests for dinner without spending too much time in the kitchen. Preparation: Wash the mussels and remove any green-algae or mud around the shells (if you have never prepared mussels before, click here for the detailed procedure). Coarsely chop the two chillies and a small bunch of coriander. Cut in half each lemongrass stick, so it will more easily release the flavour during the cooking process. Place the mussels in a large and deep sauce-pan, add the lemongrass, the chillies, part of the chopped coriander, the coconut milk and a pinch or two of salt. Cover the pan with a lid and cook for 6-7 minutes, or a bit more until all the mussels have opened. Pay attention though to not overcook them! Serve them straight away while still in the pan and garnish with the rest of the chopped coriander. You can serve the dish with slices of fresh bread on the side and dip them in the delicious juices at the bottom of the sauce pan. 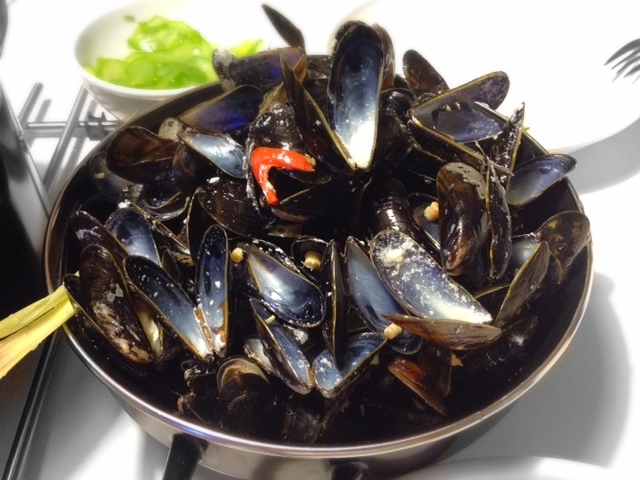 – Pay attention to throw out any mussels that haven’t opened, as it means they were dead before you cooked them. – as an original side dish, you can thinly slice a cucumber and season it with wine vinegar and a teaspoon of sugar. – If you want to obtain a thicker sauce from the juices the mussels release when they cook, sift the mussels once cooked and save the cooking juices. Use a fine strainer to separate the sand particles that were inside the shells and that are now in these juices. In a small sauce pan, melt one spoon of butter, add the cooking juices and a spoon of flour (sieve the flour so it won’t aggregate in lumps) and let it boil without lids, stirring continuously. The juices will reduce in 2-3 minutes. – you can add any spice you want to this recipe in order to obtain the combination of flavours you prefer. I would avoid adding onion as, in my opinion, the flavour wouldn’t really match with the coconut milk combined with the mussels. 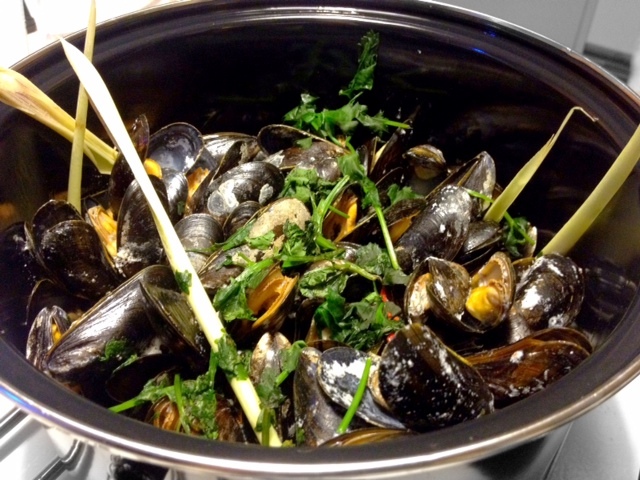 ← Mussels: select, clean, preserve and cook! We are so glad you liked it! Let us know how it tastes…we are curious! Happy Sunday!